Last night I was watching the girls’ performance night of American Idol Season 7. Same with the guys, the gals performed songs from the 70’s. During the commercial break, I scanned channels and saw a music video of Kelly Clarkson and Reba McEntire singing “Because Of You”, Kelly Clarkson’s hit song. Apparently, Reba McEntire has a new “Duets” album that featured artists with her. Kelly Clarkson just has small parts of the song while Reba McEntire belted the high notes. Honestly, I like the music video and their collaboration. Who won’t like this song anyway? By the way, I have seen this music video from Nickelodeon Channel, from all channels. 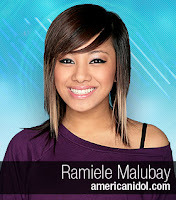 Back to American Idol, I only liked performance of Ramiele Malubay and Brooke White. Most of the girls unperformed and chose the wrong song for them. Who will be eliminated tonight? Argghh, I won’t be able to watch it again since I would do ice skating or bowling after work. Catch the American Idol results show tonight at Star World and QTV at 8 P.M.
i watched this show but did not finish it. anyway, nice blog. care to xlinks? Hey, I liked your blog! I created two slideshows for your blog.If you like my slideshow pl dont hesitate to embed it in your own blog. There are loads of different slideshows on my blog which you might like and embed in your own blog. PS: Feedbacks are always welcome! oh you really enjoyed every episode of it no.. I am learning so much from you..